The Skinny: Atomic Robo returns with the most perilous action science adventure yet – Fatherhood. I’m a sucker for mad science. Arcing Tesla coils, doomsday devices, snappy lab-wear and villainous monologues, give me the whole bit. That’s one of the reasons I’ve always found Clevenger and Wegener’s Atomic Robo so interesting. Being the robot son of Tesla himself, he is the very essence of pulp weirdness, but he constantly struggles to make sense of the world, be it through rigorously mapping non-euclidean spaces or just punching out his velociraptor arch-nemesis, Dr. Dinosaur. He’s the product of mad science, but for the most part he is trying to straighten the field back into something sensible. This is very much the case in the latest issue, which starts a new story arc, and is a great place for new readers to jump on. Throughout his adventures, Robo has gone from pulp-style adventurer to solider to scientist to tech mogul. But this story puts him in a very different role, that of a father. Through a series of events, he is now the caretaker of ALAN, a networked AI from the 1950’s that has lost its memory, and is effectively a new person. The original ALAN was willing to destroy the world, but Robo has a chance to give it an education, and hopefully a different future. Clevenger’s writing is as spot-on as it’s ever been, and Wegener’s art remains appealingly chunky. Fans of the character will find plenty to enjoy, and this is a great issue for new readers to pick up. You can find Atomic Robo and the Dawn of the New Era on Comixology or at your local comics shop. And if you like it, there are plenty of back issues to pick through for free over at Atomic-Robo.com. Written by Fabian Rangel Jr. In the future, coffee is illegal. Highly skilled courier Helena Crash has the goods, but will a delivery to Rojo, the city’s second most powerful mob boss, cost her her life? Helena Crash is a weird and wonderful Sci-Fi adventure comic for fans of Samurai Jack and Tank Girl. It’s a fast and breezy look into a smog-choked future filled with delightfully designed robots and mutants. Building this grim pulp future with coffee as the macguffin is a brilliant choice for an all-ages take on the sub-genre. Rangel’s script is spot on and does just enough to let the art do the talking. Cadwell’s style is sketchy and has the perfect middle-school-notebook tone to match the action. The designs are all real winners, from a mutant punk with a blowfish for a head, to Rojo’s wolfman bodyguard. There’s always something cool to look at on the page. Helena Crash has zoomed her way into my heart. You can find her in your local comics shop or on Comixology. Thanks for reading this review. If you enjoyed it, please share it. You can also support me on Patreon for podcasts, fiction, and more! Amelia is a magician with an unusual talent: Thanks to her Aunt and Mentor Dani, she can travel between the ‘magical’ and ‘non-magical’ world, and she has a habit of using her powers to stick her nose into matter that the police would rather she didn’t. When the two start to merge, Dani sacrifices herself to seal them off again, and Amelia finds herself alone in a THIRD place she knew nothing about: A world where magic and technology exist side-by-side. “Amelia Cole” is a story about finding your place in the world, and doing the right thing. The story is fairly nuanced. Amelia’s vigilantism causes as much trouble as it solves, but she still doesn’t hesitate to do what she can. She’s a heroine that works by guts and instinct rather than a damsel in distress. Even The Protector isn’t all-bad, even if the system he works within wears him down to a core of anger and frustration. Brokenshire’s art is a real winner. His crowds and cityscapes breath with life, and more than a few hidden easter-eggs that reward careful reading. The designs for Amelia are great as well. It’s sad how rarely we see a comic book heroine wearing actual clothes. Amelia Cole and the Unknown world marks the first part of what will hopefully be a long series of adventures. Volume Two, Amelia Cole and the Hidden War, continues her adventures in the strange world she finds herself in, and I can’t wait. 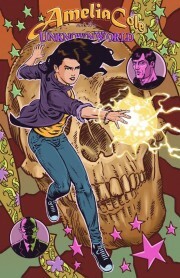 Amelia Cole and the Unknown World is available digitally through Comixology, and in print from IDW.